NiftyBlocks is great creative and survival friendly mod in which adds in various materials, lawn flamingos, the nifty block, and much much more! 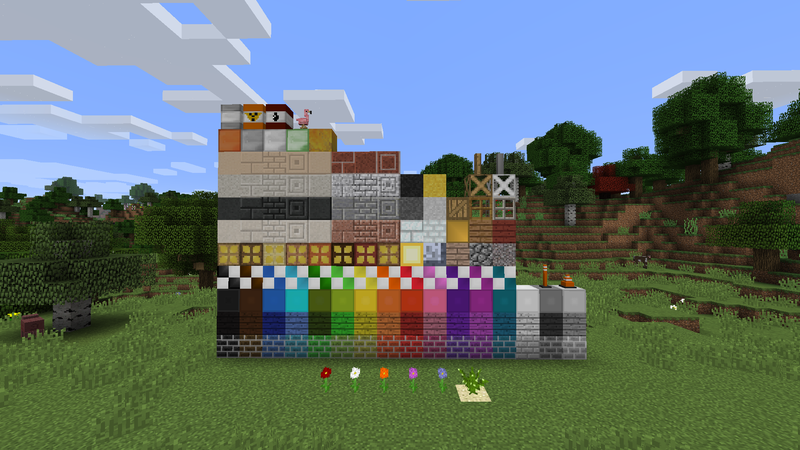 You can craft a rainbow of dyed versions of wooden planks and bricks with the addition of NiftyBlocks own sets of blocks like checkered tiles and the lamps. Light up your land with the lovely wooden lamps and the previously mentioned colored ones. Hungry? fear not because NiftyBlocks adds in 28 different foods including pizza, various fruits, doughnuts, bacon, tacos, and much much more, this also includes some of your favorite carbonated beverages like coca cola and some other brands. 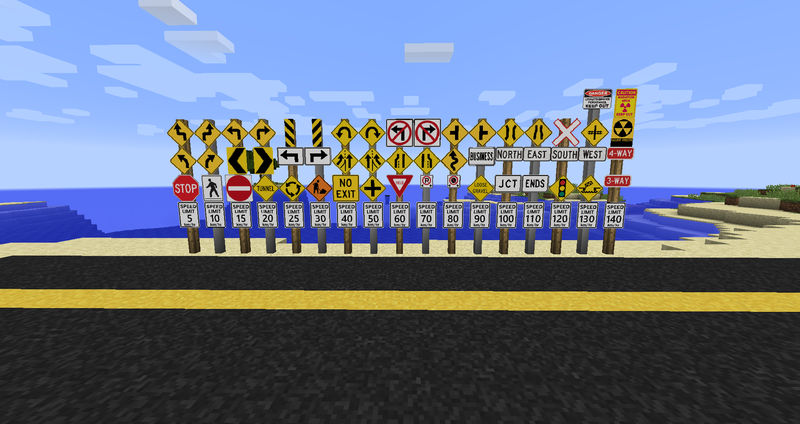 NiftyBlocks is an excellent addition to your game if you are a modern map maker because NiftyBlocks adds in various traffic signs, asphalt in black grey yellow and white colors, traffic cones and safety poles for your modern Minecraft city. The sky's the limit with NiftyBlocks! and a special thanks to goldensilver853 for getting me started. If you enjoy my mods and for whatever reason wanna send me some of your hard earned money, consider clicking on the button below. I don't see much of a point in doing so. There shouldn't be any conflict in recipes since the asphalt and most of the foods don't have them. Okay, maybe after they get recipes then? I'd rather be able to reduce redundancy. I'm probably not gonna do this. 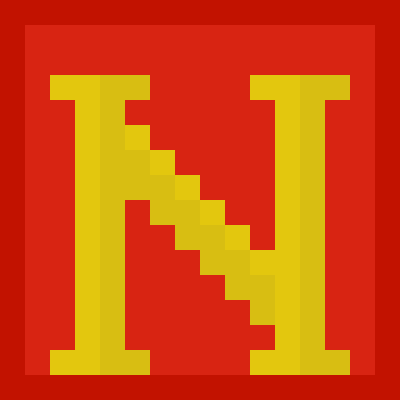 NiftyBlocks is a primarily miscellaneous mod and I don't really focus on it clashing with other mods that add in similar things. I'll consider splitting up the categories of NiftyBlocks into their own mods entirely for 1.13 (whenever I decide to work on that) but for now, there's little reason to do this. Hmmm, perhaps a way to disable certain features of the mod like the asphalt, foods, and such? The aforementioned ones are already done in my mod setup by Immersive Petroleum and Pam's Harvestcraft, respectively. Forgive me but I can't seem to get the vending machines to work, there's only one type and right clicking with an emerald does nothing. Am I the only one having this problem and am I doing something wrong? As of the 1.12 versions the vending machines are purely decorative. hey what else does this mod have does it have different types of materials that u can use for house building? The smelting bug is fixed. yeah i just went in and switched out the files, nice mod though! Typically (in real life) tools aren't made out of copper, aluminum, or tin. I might add in bronze that could be craftable through the alloy smelter with a set of tools and armor. I'll try and add in a set of steel armor for the next update. Thanks for the suggestion. Config would be good. I *really* don't need another mod adding marble to world gen. I'll look into doing that.